Eastminster’s Memorial Garden provides an outdoor living space for our church family while serving as a revered resting place for those who have gone beyond. The garden is a celebration of life and a celebration of Our Heavenly Father, His son, Jesus Christ and His Holy Spirit. There are times when we visit the garden to have some quiet time with departed loved ones. There are other times when we just enjoy the surroundings as part of a church activity. 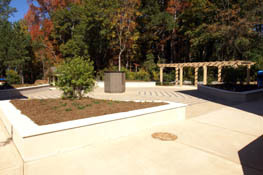 The Memorial Garden-Columbarium extends the spiritual, timeless life of our church. It brings the country church yard of old into the practical modern world as a significant asset to our congregation. The enclosed Garden is a verdant outdoor setting for meetings; for gatherings around the coffee brewer. There are lots of areas for sitting, for meditating, for conferring with associates. This attractive, peaceful area is available for memorial services and other church events. Tables and chairs and lighting can be added for both day and night functions. 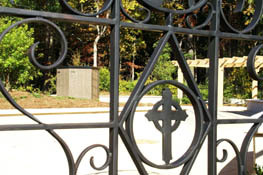 The Memorial Garden-Columbarium is designed to minister to the needs of Eastminster Presbyterian Church members and their families — providing a dignified garden setting for the cremated remains of members and their families. Columbarium comes from the Latin name for the dwelling place of a dove (columba), which Christians believe is the symbol of the Holy Spirit. Each niche has space for one or two urns for the inurnment of cremated humans. Each Niche shows the name(s), date of birth and death of the deceased, and, if desired, a Bible reference (ie. John 3:16). 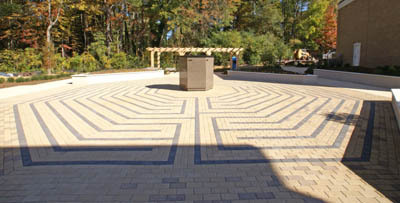 Eastminster’s Memorial Garden also features a Labyrinth patterned after the Amiens Cathedral labyrinth in Paris. A labyrinth is an ancient symbol that represents wholeness. It combines the imagery of the circle and the spiral into a meandering but purposeful path. It looks like a maze but is not. A maze is a left brain task that requires logical thinking and analysis to find correct paths. A labyrinth is a right brain task involving intuition, creativity, imagery, and the search for possibility. Unlike a maze, a labyrinth has no dead-ends. You cannot get lost. You just follow the path to the center and out again. A labyrinth walk can be a peaceful activity, helpful in centering your mind and attention on prayer of meditation of Scripture. Try walking “The Lord’s Prayer” or memorizing a verse of Scripture and walking with it through the turns. Or just spend some time with Jesus laying aside the cares and distractions of the world. Medieval pilgrims, unable to fulfill their desire to make a pilgrimage to Jerusalem, went instead to many pilgrimage sites in Europe or Britain. In many cases the end of their journey was a labyrinth formed of stone and laid in the floor of the nave of one of these great Gothic cathedrals. The center of the labyrinths probably represented for many pilgrims the Holy City itself and thus became the substitute goal of the journey. The sacred geometry of the labyrinth involves the numbers four, seven and twelve, emerging out of the “paths” and “walls” themselves. The labyrinth is divided neatly into four quarters standing, in the medieval mind, for the four gospels (Matthew, Mark, Luke and John). Seven is the number of 180 degree turns there are in each quarter of the labyrinth. This relates to the seven Liberal Arts of medieval education, or perhaps the seven paths of the classic medieval cruciform labyrinths. Twelve is the total number of the labyrinth’s paths and center, thus relating it to the twelve-month calendar or the twelve disciples of Jesus. The six “petals” of the center of the Chartres labyrinth (and, in our case, the six facets of the Columbarium) provide individual opportunities for symbolic representation and meditation. Always open. Come and enjoy this space dedicated to the glory of God. As we say at Eastminster, “At the heart of our fellowship is joy in communion with Christ.” Come and draw closer to Him.